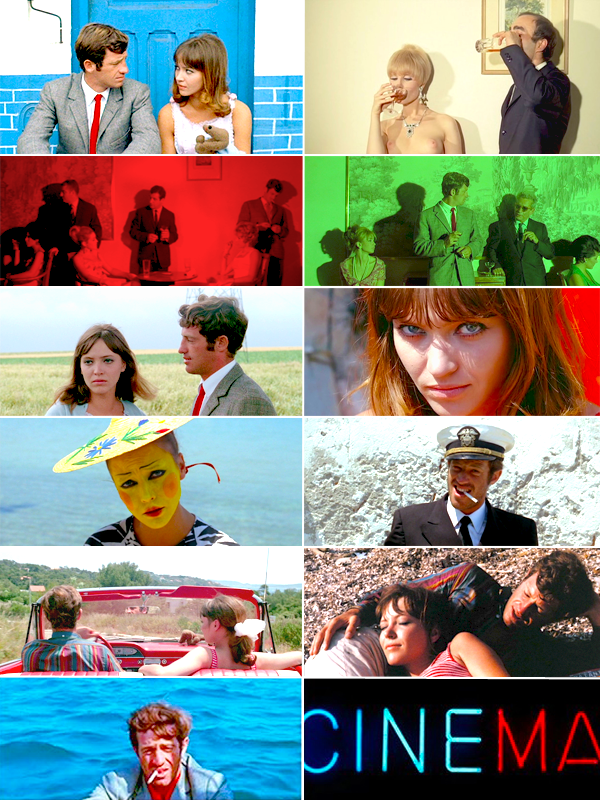 Pierrot le Fou is the story of a man (Ferdinand, played by Jean-Paul Belmondo) who leaves his wife, kids and wealthy life behind to run away with his ex-lover (Marianne, played by Anna Karina), who is being chased by gangsters. Its story is adapted from Obsession, a novel by Lionel White. But that’s not terribly important – in fact, halfway through the film I had no idea where they were, if the gangsters were still after them, or where could it all possibly be leading to. And the truth is, it didn’t really matter, for I didn’t really care what happened. What I did want to know was what would be the next shot. What would Godard do next, what colours would he highlight, what angle, what wacko editing technique would he use. It’s that touch of Godard (more like a punch) with color filtered shots, fake props, but true thoughts, that we hungrily absorb for nearly two hours. Karina and Belmondo impersonate this captivating ride through style with incredible spontaneity and never taking anything too seriously. Conflicting ideas and half expressed emotions are perceptible but not fully comprehensible at first watch, for they’re fleeting, never lingering. Like the film itself, it’s an absurd chaos, like an experimental collage, but it’s strangeness is so intriguing and stimulating that it becomes entertaining, and so we watch it with the utmost delight. Through references to pop culture and Godard’s own work, that we may or may not catch, it’s not only sense-shocking, but also sensual, sometimes sweet, at times bitter, but always unsettling like a slap in the face – one that lingers. It was my first Godard film and, from what I know, they’re better seen than talked about.